Back at BlizzCon, Blizzard told us they were working on a series of animated short films set in the Overwatch universe, to be released closer to the game's launch. Well now that we have an official launch date, the shorts are going to start rolling in—along with a variety of comic books. 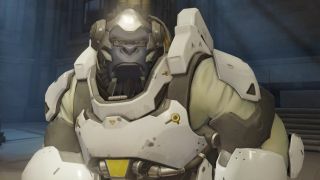 The first short is called 'Recall' and centers around Overwatch's scientist gorilla Winston, including a look at his origin story. You can watch the full thing above, which is oddly hosted on the Xbox YouTube channel. It's great to finally see what Blizzard has been cooking up, and incredibly exciting that the quality level hasn't dropped since the announcement cinematic at BlizzCon in 2014. The theatrical teaser that was shown in some movie theaters before Star Wars Episode 7 was an encouraging peek behind the curtain, but Recall shows that Blizzard still understands how to tell a whole story in just seven minutes. This is also the first morsel of new story information we've seen about Overwatch for a while, which Blizzard told us it's making up as they go along in an interview last December. Now it's only a matter of time before super-fans tear this video apart frame by frame looking for Easter eggs. The scene in which pictures of Overwatch agents are flashing across the screen in particular looks ripe for some hidden information. We aren't sure which short is coming after this, but Recall has made me hungry for the next one. And if you caught any secrets, let us know in the comments below.